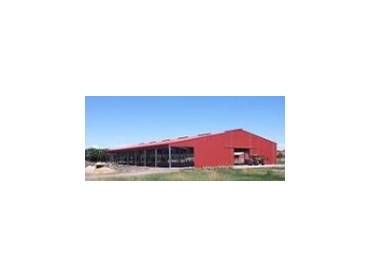 Wide Span Sheds is the industry leader when it comes to Farm Sheds, whether it be Open Sided, Fully Enclosed, or Lean-To fitted. "Open Sided Farm Shed" You can adjust your height to exactly the clearance you require. Up to 7 meters (23') is easily designed but we can do special designs well beyond that if required. We can design the bay spacing to suit your requirements. Up to 9.0 meters (30') can be achieved simply, however you can have openings of up to 12 meters ( 40'). Once we understand your personal requirements we can advise you of the most economical way of achieving your needs. The gable ends can also be opened if required. Again up to 8m (26'6") is simply achieved, and 35m (115') is obtainable without much expense. When enclosing your building you can fit sliding doors in either your gable end or the side of the building. The size of your sliding doors are flexible but it is recommended that your door width is no more than 6m (20'). This is for ease of opening and for door strength. You can still achieve large openings by just running a series of doors instead. The sliding doors are supplied to you in a kit for easy onsite assembly and are supplied with your building from Australia's leading sliding door manufacturer. Using roller doors is less popular on rural buildings due to the decrease in clearance heights you will receive. Roller doors are available in various sizes up to 5.1 meters x 5.1 meters before having to go to a Roller/Shutter. Ask your Wide Span Sheds product manager to help you design a building to suit your requirement. You will normally find that by extending your building width by adding a Lean-to is an economical way of creating more space for less money. Our buildings are designed to support "Lean To's" of up to 75% of your original span both sides. This can be done at time of initial purchase or as your needs change. We have had customers save up to 30% of their building price by using this method of design. It especially saves you money in spans between 20 to 40 meters (66' to 123'). Other options in farm buildings include various roof pitches, internal walls, mezzanine floors, skylight sheets and personal doors.